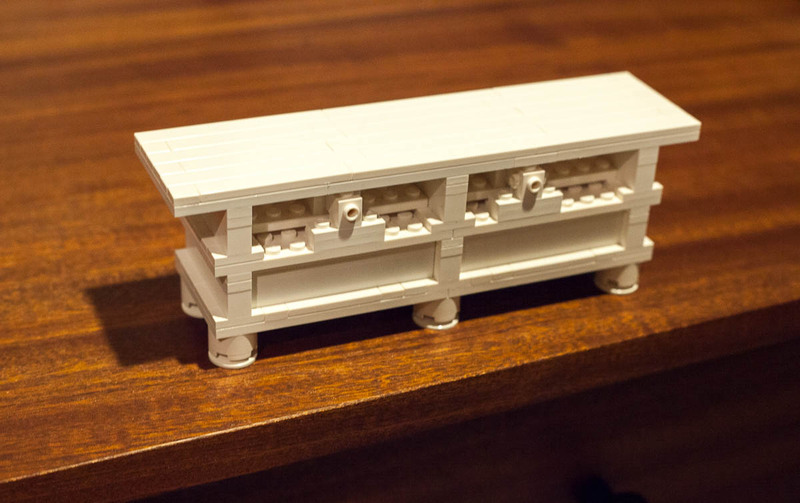 Today’s challenge: Build a detailed furniture model using Lego bricks. After two projects in a row constructing buildings, I wanted to try something a bit different. 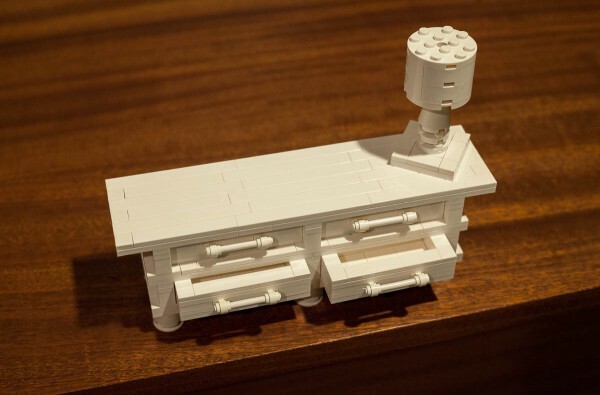 I decided to build a model of some furniture instead. I chose in advance the challenge of building a functional chest of drawers as it seemed like a good challenge. 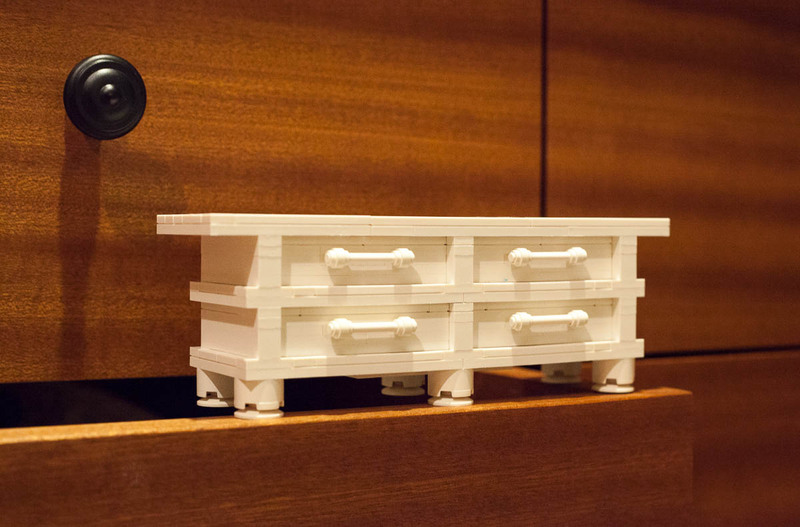 I based my design on the horizontal accents of Frank Lloyd Wright’s architecture, and the overall design is similar to the dresser we recently had built by McKinnon Furniture here in Seattle. Again, I didn’t have enough pieces to build all four drawers so the back isn’t pretty and the top two drawers don’t open at all. Dresser with a lamp accent. More than ever, I felt limited by not having enough plates and 1×2 jumpers. I had wanted to build 3 rows of drawers but that wasn’t possible without more pieces. I definitely need to buy a lot more of them as they are key to my building style. Again, I used pieces outside of the core Architecture Studio set. For this project, I used bars and loops to improve the look of the drawer handles. 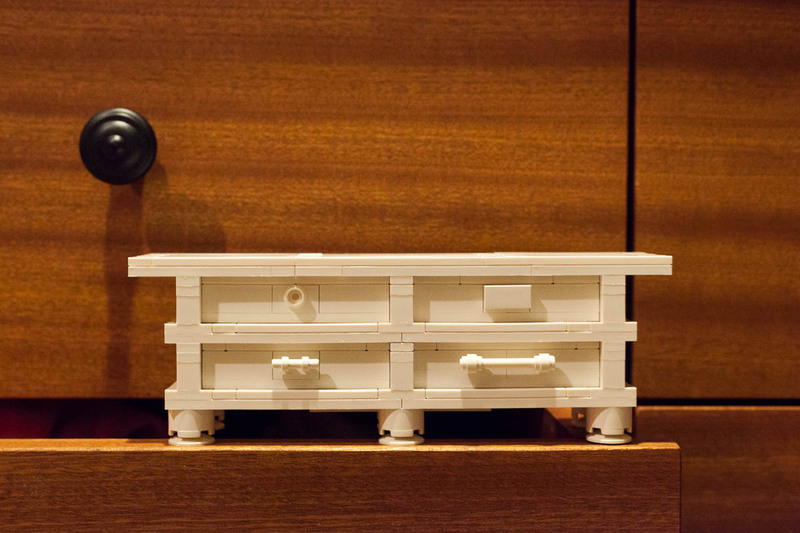 I also used 2×2 code as part of the lamp accent that I built after finishing the dresser. This was fun, and the only real challenge was working around my limited # of plates and 1×2 jumpers. I really like how the project looks, and I like the photos I took using our handmade wooden dresser as a backdrop. Your Architecture Studio 30-day challenge series is very informational. Your builds are awesome! Reading what you’ve created, I’m leaning more and more to buying this set.